Carlo Rovelli reflects on the gravitational waves announcement. 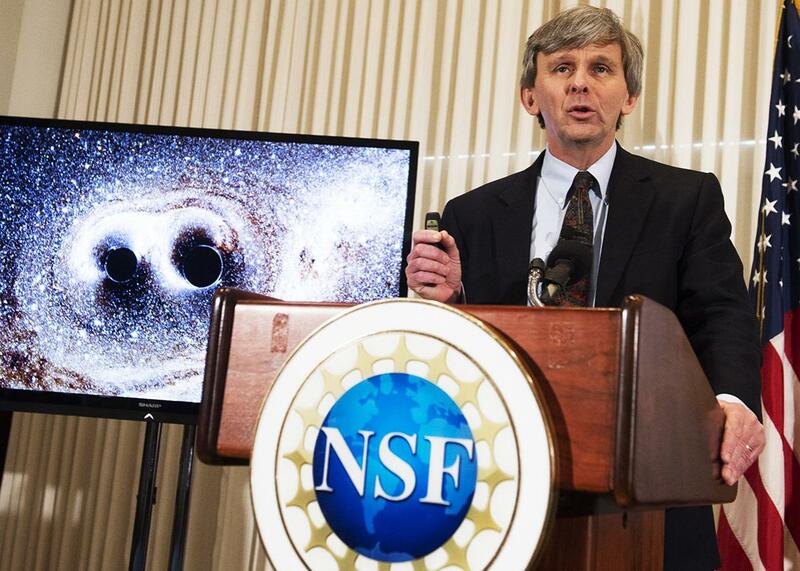 A theoretical physicist reflects on Thursday’s spacetime-bending announcement. David Reitze, executive director of the LIGO, announced that scientists have observed ripples in the fabric of spacetime called gravitational waves for the first time on Thursday. After months of rumors and one very emotional press conference, it’s finally official: Gravitational waves have been detected. For physicists this is an ecstatic moment. Until yesterday, the only fundamental waves we’d ever observed were electromagnetic waves: radio signals and light. Today we have seen the other half of the sky. It is a bit as if we had to rewrite the book of Genesis, replacing “Fiat Lux” with “Fiat Lux et Gravitatis Fluctus”: Let There be Light and Gravitational Waves. These new waves have much in common with their electromagnetic sisters, but also something different and strange: They are ripples of space itself. But more than the strangeness of nature, or the mastership of the scientists who have built an antenna capable of seeing these waves of space, what is truly spectacular is that we knew about these waves long before seeing them: Albert Einstein’s theory predicted them a century ago. If a benign nature wanted to honor the centenary of Einstein’s idea, She has found the most elegant way. It’s hard to imagine a more vivid indication of the power of scientific reason: from indirect evidence and clarity of thought, reason sees so far that it takes another century before our eyes and our hands can follow up. The existence of gravitational waves is a consequence of the fact that nothing travels faster than light. Light from the sun takes eight minutes to reach Earth. In the (unlikely) event that the sun were to suddenly disappear, say swept away by a fast wandering star, what would happen on Earth in the next eight minutes? Right answer: nothing—because no news of the event would have the time to reach us. The gravity of the sun holds the Earth in its orbit, so for eight minutes the Earth would still be attracted by the sun, even though the sun was no longer there! During these eight minutes, something would have to travel through space, carrying the information that the sun had disappeared, and its attraction should cease. That something is a gravitational wave: the rapid spread of a minute deformation of space. The wave that LIGO has now been able to observe is the product of a catastrophic event: the merging of two black holes, each having the mass of several dozen Suns. The energy their spiraling impact radiated into space was that of three Suns vaporized in a fraction of a second. This cosmic explosion raised a galactic tsunami that has traveled more than 1 billion years through interstellar space to swash weakly at LIGO’s shore. An antenna for observing these deformations of space is simple in principle. Just take two objects, like two balls hanging on threads, and accurately measure the distance between them. A passing gravitational wave alters the distance between the two balls, stretching or contracting the space between them the way a passing breeze wafts a clothesline. The problem is that this change is small, and detecting it requires highly advanced engineering. LIGO’s detectors measure the varying distance between two masses four kilometers apart. The construction of these antennas required the work of dozens of physicists, technicians, engineers, and hordes of students for decades. Now that the waves have been detected, we can use them to look at the universe: we are at the point where Galileo, after perfecting his telescope, aimed it at the sky. I am sure that what we see will, once again, amaze us. At our dinner many years ago, I asked Richard Isaacson what gave him the belief LIGO could succeed. His answer was sharp: He trusted Kip Thorne. Kip is one of the great relativists. Years later I asked Kip what had made him so confident that the project would be a success. Kip waited a long time before answering, looking into my eyes. Then he asked me, “Do you think we should not try?” It took 25 years, but now I finally understand: Kip was right. We have seen gravitational waves. It is a triumph for science, yet another triumph for Einstein, a triumph for Thorne and Isaacson and their poker-like bet. It is a triumph for a small community of stubborn researchers who have spent their lives building a fantastic device, chasing a dream: to see a completely new type of entity that no one had ever seen before. A dream based on faith in reason: that the logical deductions of Einstein and his mathematics would be reliable. But faith in reason is a peculiar faith, one that requires confirmation. We have checked. The waves are there.